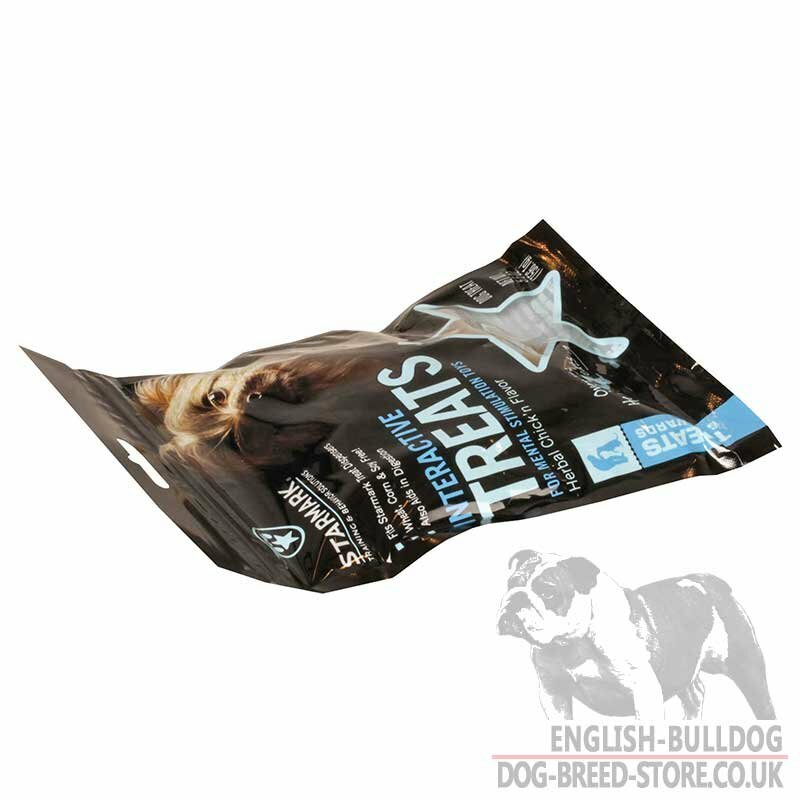 English Bulldogs are hearty eaters, so one should always keep an eye on their feeding to prevent overeating and obesity. But how to choose healthy dog food for your Bully among a plenty of dog treats you see on the dogs' products market? Just choose the best one! 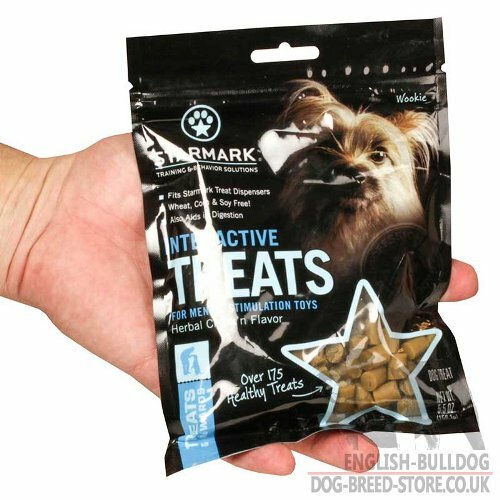 This dry dog food was developed by Starmark Academy together with the best vets and nutrition experts to make it really healthy and wholesome for Bulldogs. 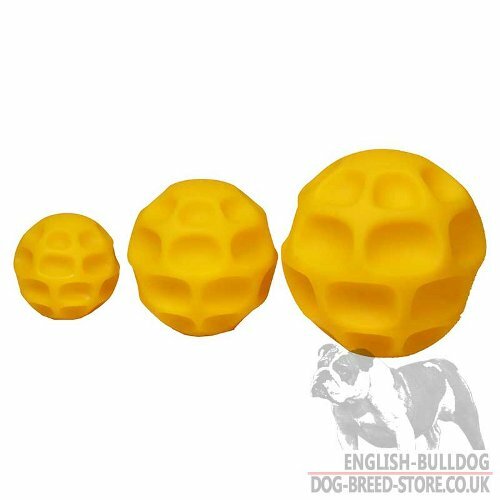 But the experts took it a step further and designed special dog treat dispensers for this dog kibble to make Bulldog feeding gradual and measured. 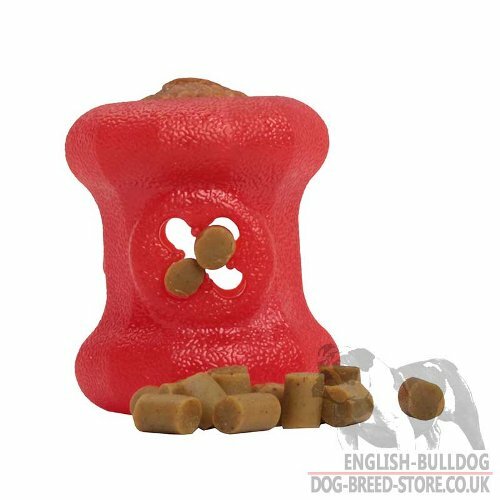 Put these dog treats into the treat dispensing dog toy and watch how your Bully plays with it getting yummy delicacies piece by piece. 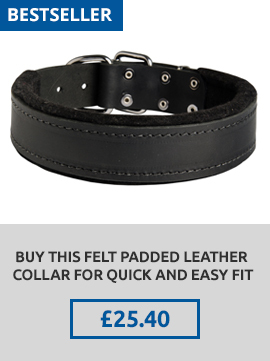 It's a real mental challenge for the dog! What is the result? 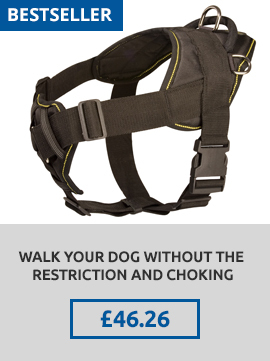 The dog feels happy and doesn't overeat, standing to benefit from natural and wealth food. This dry dog food is a result of fruitable cooperation of world-renowned experts in animal health. 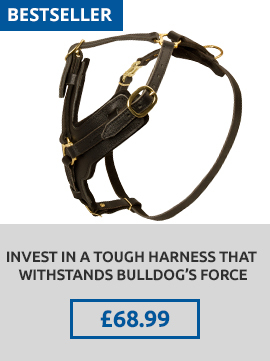 Approved by lead vets and dog breeders. Ingredients: Rice Flour, Potato Starch, Vegetable Glycerin, Water, Tapioca Starch, Cellulose, Natural Vegetarian Chicken Flavor, Lecithin, Brewers Dried Yeast, Sesame Oil, Ginger, Sodium Diacetate (a preservative), Cinnamon, Anise, Potassium Sorbate (a preservative), Fennel, Vanilla, Peppermint. 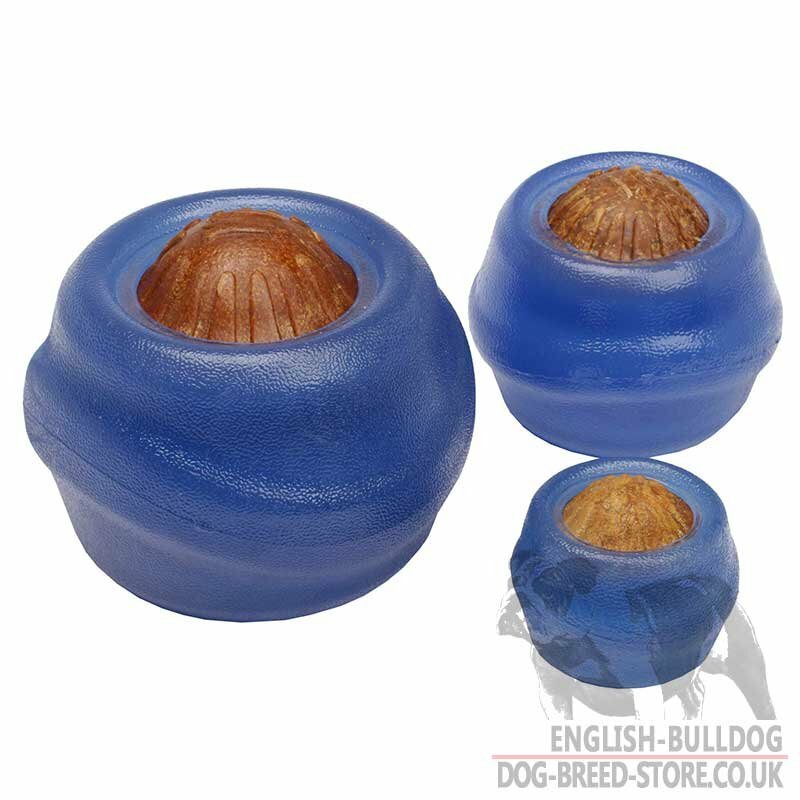 Look at the most suitable dog feeder toys for this kibble! This dog feeding control ball is produced in three sizes, small size - 3 inch (7 cm) is the best for Bulldog puppies, medium size - 4 inch (10 cm) is suitable for young Bulldogs and big size - 5 inch (13 cm) is recommended for adult and large Bulldogs. 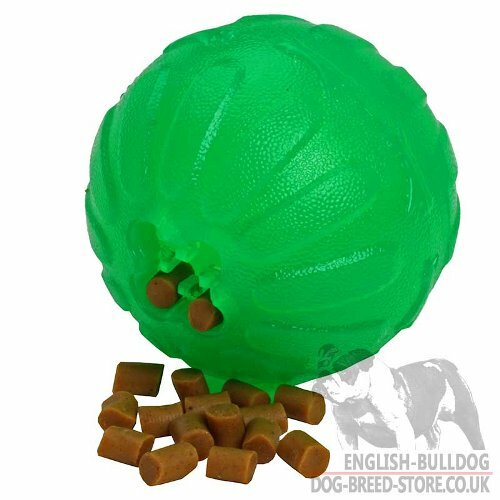 This green treat dispensing dog ball is also produced in three sizes: small - 2.8 inch (7 cm), medium - 3 inch (8 cm) and large - 4 inch (10 cm). 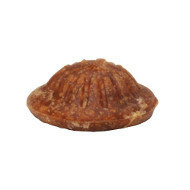 Orange bento balls are available in small - 1.6 x 2.4 inches (4 x 6 cm), medium - 2 x 3.5 inches (5 x 9 cm) and large - 2.4 x 4.3 inches (6 x 11 cm) sizes. 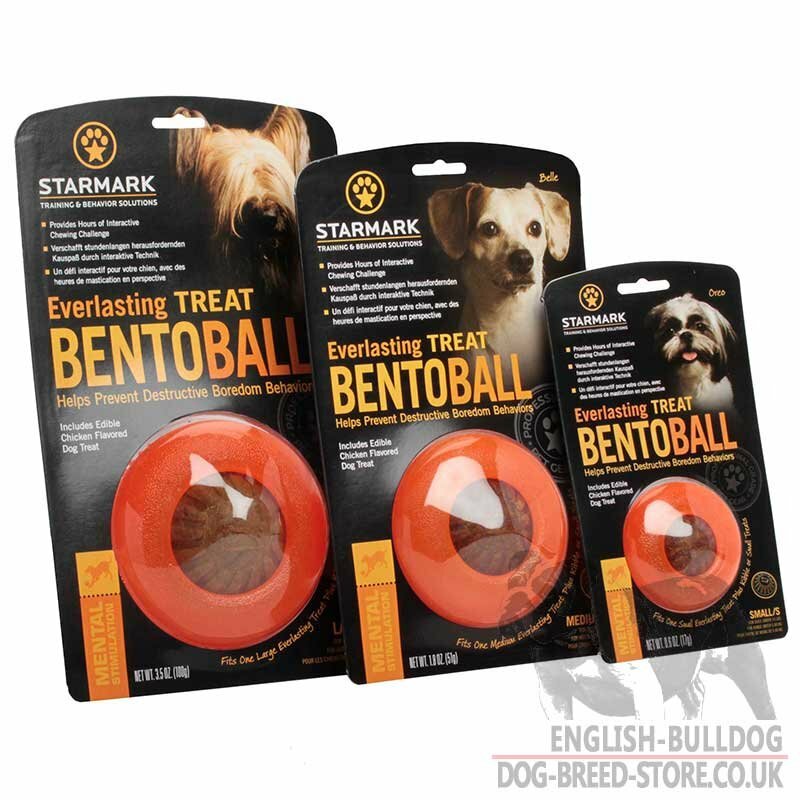 Choose small - 2 x 2.5 inches (5 x 6 cm), medium - 3 x 4 inches (8 x 10 cm) or large size - 4 x 5 inches (10.5 x 12.5 cm) of these dog treat balls. 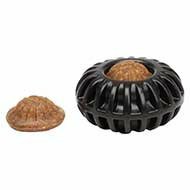 Fireplug treat holders are in small - 2.3 x 2.9 inch (6 cm x 7.5 cm), medium - 3.5 x 4.3 inch (9 cm x 11 cm) and large - 4.3 x 5 inches (11 x 13 cm) sizes.